Drylaw, also known as Old Drylaw House, is a ruined 17th century L-plan tower house. The earliest reference to Drylaw seems to be in a document from 1296, which refers to a Walter of Drylaw (Walterus of Drylawe), and it is likely a castle was built to protect the lands. Thomas Forrester was granted a charter of the lands of Drylaw in 1406 following the death of his father Sir Adam Forrester of Corstorphine the previous year. By 1491 the estate had been divided into Easter and Wester Drylaw, although both, rather confusingly, seem to have been referred to as Drylaw in various sources. The Wester Drylaw seems to have been the more important property, appearing more prominently on later maps, and Easter Drylaw may just have been a farm attached to the castle. The Hope family possessed Easter Drylaw in the 1550s, while the Forresters continued to own Drylaw (Wester) throughout the 15th and 16th centuries. In 1544, Drylaw was burnt by the English under the Earl of Hertford during the Rough Wooing. Later it was rebuilt, although it is unclear exactly when. 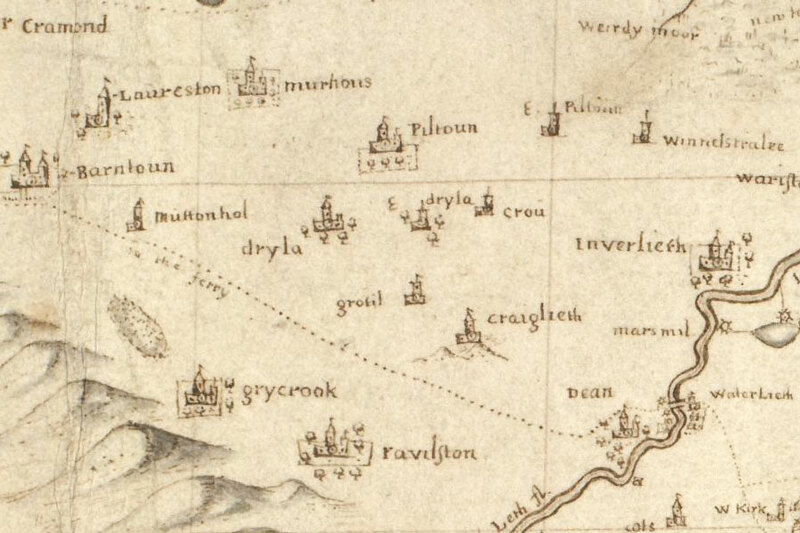 Elizabeth Forrester, daughter of James Forrester of Corstorphine, married David Makgill of Nisbet and Cranstoun-Riddell in 1557, with Drylaw transferring to the Makgills at this time. The Makgills seem to have either sold or rented Drylaw to the Crichton family, as by 1570 Alexander Crichton is described at the Laird of Drylaw. The property of Cranstoun-Riddell seems to have been similarly treated, as there is a reference to a William Crichton of Drylaw divorcing his wife, Beatrix Renton, because she committed adultery with his brother, James Crichton of Cranstoun-Riddell. Sir James Makgill of Cranstoun-Riddell is listed as owning Drylaw in 1641, and it is said that the Makgill family combined both Drylaws, Easter and Wester, into one estate in 1638. In 1641 the Makgills sold Drylaw to James Loch, whose family would own Drylaw for the next 145 years. It seems likely that the Loch family made additions to Drylaw, as there are mid-17th century details forming part of the existing ruins. 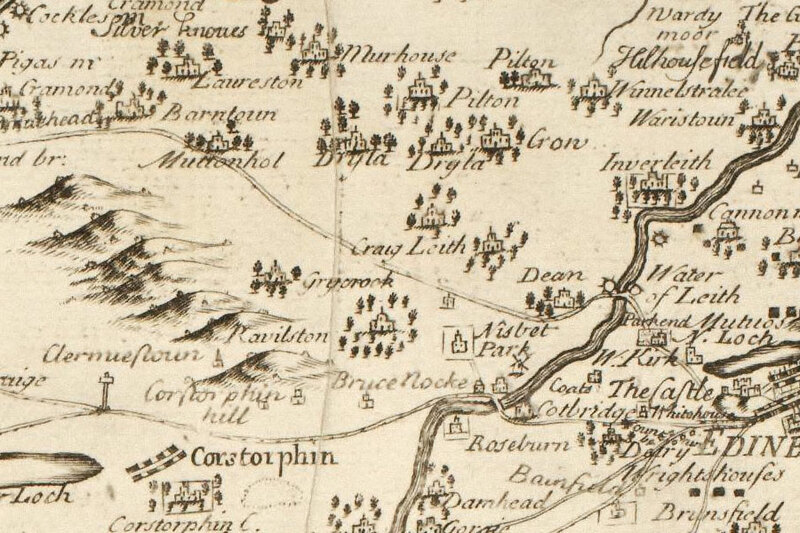 John Adair’s map of Midlothian, dating to around 1682, shows Dryla twice (presumably for Easter and Wester), with the wester portion being illustrated as a larger property. In 1718 the Lochs of Drylaw built a new house immediately to the south of what became known as Old Drylaw House, and the older building was at some point converted into stables, incorporating late medieval gargoyles which are thought to have come from the original castle. At this time the property was surrounded by farmland, with two farms associated with it – Drylaw Mains (located just south of Ferry Road at the top of Groathill Road North) and Easter Drylaw (located just south of the midpoint of Easter Drylaw Place). 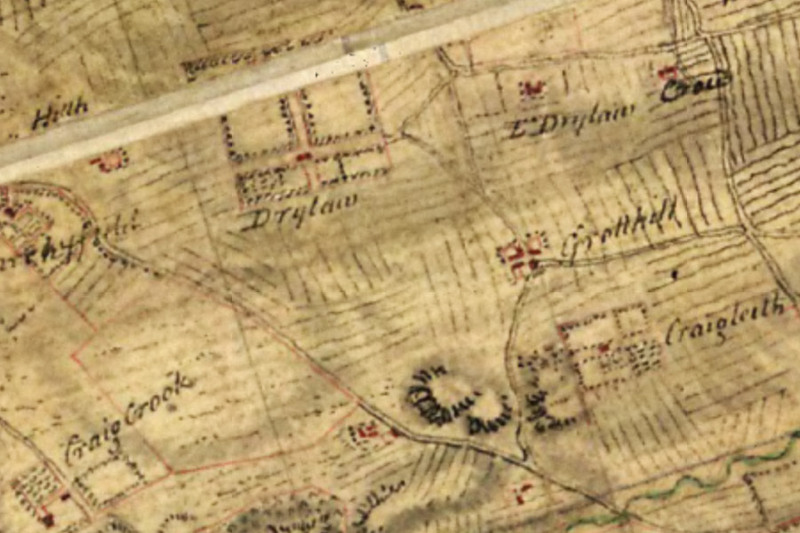 Roy’s map of 1745 shows Drylaw at the centre of extensive gardens, along with the smaller property of “E Drylaw”. George Loch of Drylaw sold the estate to William Ramsay (later of Barnton) in 1786. William Ramsay lived at Drylaw House for “a year or two” before buying Cramond Regis (later renamed Barnton House). At some point in relatively recent history the stables were allowed to fall into disrepair, although the new Drylaw House has been maintained and is still occupied as a private residence. Parts of the old estate were sold off, with housing estates being built on the land. The old farm of Easter Drylaw was built on in 1936 when Easter Drylaw Drive was constructed, and development continued until the 1970s. Drylaw is in the parish of Edinburgh and the county of Midlothian. Published on the 20th of January 2013 at 10:14 pm. Updated on the 21st of March 2019 at 11:14 am.